Despite unabashedly having bites of every pie flavor for Thanksgiving, we know that most times, desserts are pretty optional and should be reserved for special occasions. And as far as first world problems go, having too many rich desserts is pretty high up there. But, having a better dessert option round-up list is never a bad thing! All these desserts are legit delicious and ‘better’ to one degree or another. Here we go! Okay. You want the truth? 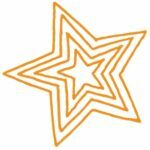 Here it is: if you are trying to be on a diet or trying to loose some LBs or trying to not gain weight or trying to not eat sugar or lay off the carbs- you need to leave the sweets at the store. Seriously. Just leave them at the store. If is not in the house, you are more likely to resist the temptation. And if you think you gotta go to the store- go drink a large glass of water and tell yourself you can go in 5 minutes and in 5 minutes so drink another massive cup of water and tell yourself 5 more minutes… does that really work? Anyway, I go through periods in my life when I really, really try to eat well. And that includes dessert. And sometimes those better choices just get made once a week or once a month. But, we are here to bring out and dust off some of our past desserts that are on the better side. I think we should start with skinny pie. Just go back and read, run right out and buy the ingredients and make one- you will see that it’s really rather delightful. If you dig around your cupboard you will also likely be able to find all the fixings for a mug cake– it is deceptive at how yummy it is even if it is not so yummy looking. And also, while I am trotting out all the better desserts, we need to revisit the skinny ice cream sammies. I mean, you can leave out the graham crackers and just eat the filling and you will make out fine just fine. I have just two more that are worthy of honorable mention. The first is dark chocolate almond milk– you can do all kinds of delightful desserts with it- particularly if you throw it in your blender with some ice… and a banana- it will get you through. 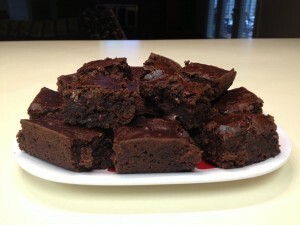 And then let’s not forget my friend Jeanie’s black bean brownies— I mean, bada bing- bada boom! There you have it. Some great better dessert options. Leigh has even more- so between us you should be set for a while. Oatmeal Raisin “Cookies”: Portable, delicious oat and fruits. 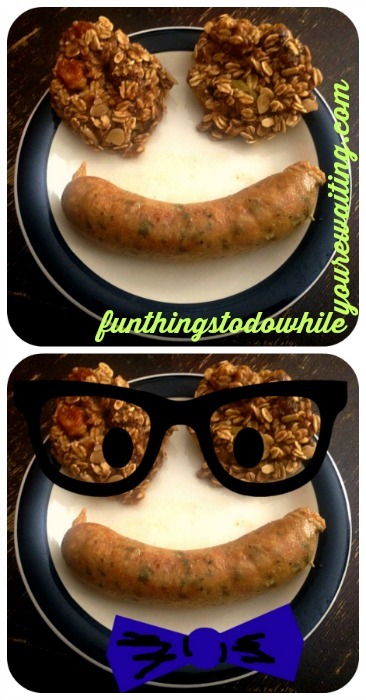 Can also be used for breakfast or a snack. What can’t this not-cookie (but totally a cookie) do?! Milky Ice Berries: So simple. So yummy. Berries and whipped cream are also in heavy rotation. Healthy Bananas Foster: One of my favorite of tastes in a much friendlier package. Outshine Bars: Really yummy popsicles with slightly less sugar and more real fruit. Olive Oil Cake: Although this recipe isn’t particularly “better” for you, if you sub the white flour with almond flour, and use Swerve instead sugar, me thinks you’d have a winner… Am formulating mug cake calculations as we speak. 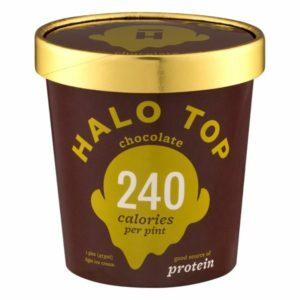 As far as new stuff on my radar, have you guys heard of/seen Halo Top Ice Cream in stores yet? Supposedly, it’s in nationwide distribution, so be on the lookout for it. It is definitely science ice cream. Made with real cream and eggs, but so little sugar. It also has a consistency of “space ice-cream” from the 9o’s, which sounds like I’m dissing it, but it’s actually pretty great. The chocolate, vanilla, mint chocolate are the standouts. Coralie introduced me to mug cakes during a visit to her freshman dorm room at Milsaps in the way back of 1999. Strawberry cake mix and water nuked to perfection. I remember it being delicious. As I’ve aged, my mug cakes have evolved. Much like me! With some smarter substitutions, mug cakes can be back in the rotation for those times when only something that feels warm and decadent will do. Plus, when you are only making a mug full of cake, vs. a cake full of cake, then you fret less about eating the leftovers! 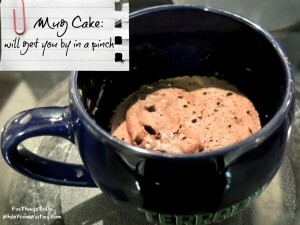 I found a great recipe from Pinterest that I use as a base mug cake recipe and then vary it times infinity. And have also recently found a peanut butter, egg, and sweetener one that is so good and beyond quick and easy. Can you keep dessert things in the house? Have you tried HaloTop Ice Cream? We know one thing, readers, we’re sweet on y’all. Let us know YOUR go-to better dessert? And thanks for following along with our Better Series!